La debacle Venezuela: US & Nepal! N.P. Upadhyaya, Kathmandu: Nepali population is gaining much needed experience of a Communist Dictatorial rule, while stage is also set for a vertical split in the ruling Nepal Communist Party. The party is ruling the country for almost a year with iron clutches a la North Korean regime. Days are getting harsher and harsher for the common men. A rare phenomenon in the present day global order that is more or less a “democratic one” but, Nepali population had willingly voted for Communists in the last national level polls. Are these bunch of Thugs ruling the country communists in real sense? The world is the witness that Communists are in essence a group of international Thugs who thrive on by cheating the poor. The Communist Thugs of Nepal own Swiss bank accounts and the national plunder continues unabated. Under the Communist regime, Nepal has left India and Pakistan far behind in the list of world’s most corrupt nations. Transparency International recently listed Nepal as world’s third most corrupt country, which explains the miracles of India imposed 12 point order. Thanks India for this expensive gift. It is a matter of “utter shame” that the United States and rest of the democratic world is witnessing the unfortunate advent of a mirror regime of North Korea in Nepal. And, it remains yet a mystery why this regime has gone as of now unpunished? This is really unfortunate. Two North Korea in Asia? Unbelievable but true! On the other hand, mischievous steps taken by Chairman Pushpa Kamal Dahal ‘Prachanda’ of the Nepal Communist Party is likely to take its toll. Seeds of the expected split have already been sown in the ruling Communist Party by the New Delhi’s trusted man. Comrade Prachanda, a politically unreliable and personally unstable personality has under the “instructions” of his New Delhi masters taken the lead in bringing about a rift in the ruling coalition. A person who decides to mass murder seventeen thousand innocent lives cannot be considered normal? He deserves a harsh punishment. Prachanda during Prime Minister KP Sharma Oli’s absence from the country issuing a strong worded statement denounced the United States for unnecessarily interfering in the internal matters of a far flung Venezuela. In a statement issued on behalf of the party that he co-chairs with Prime Minister Oli, not only Prachanda exhibited his communist brotherhood with Venezuela but concurrently also tried to undermine the recently found “love and honor” of Nepal government towards the United States of America. Especially love was restored between the two countries after the long awaited lovely meet between Nepal’s Foreign minister Pradip Gyawali and US Secretary of State Mike Pompeo that took place in Washington D. C., December 18, 2018. It is only natural that Prachanda’s statement would annoy the United States because it was primarily issued to irritate it by a design. Matured analysts believe that the anti-US statement was issued under the instruction from his masters seated in New Delhi. 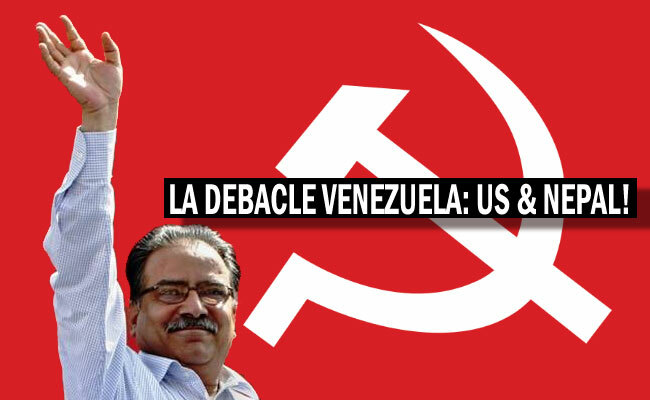 The US now suspects the very motive of both: Prachanda and that of Nepal Government on Venezuelan affairs. Prachanda’s statement expressing concerns on Venezuelan sovereignty does not match with his past activities as well. To recall, Prachanda and his deputy Baburam had reached an agreement with the Indian regime back in June 2002- according to which, Nepal Maoists shall in no way hurt India’s interest in Nepal and in lieu India will provide all sorts of supports to Maoists to create panic in Nepal. By reaching the shameful agreement with India or say committing a treachery that largely compromised Nepal’s own sovereignty, and now the same Communist leader is criticizing the United States for undermining sovereignty of Venezuela. This statement pushes or at least tries to push the country to the Russia-China Axis and, in doing so the communist leader has made deliberate attempts to further annoy the US. Prachanda’s statement has a purpose and that is also to appease China which had insulted him during his last Beijing visit. He was not allowed to meet any high ranking communist party leaders by China’s communist regime. And why should China honor a declared Delhi man? To the utter dismay of the United States and of the neutral observers in Nepal, Narayan Kaji Shrestha – a powerful ruling Nepal Communist Party leader has added fuel to the fire. Shrestha said that both government and Communist party will double their efforts in challenging the US intervention in Venezuelan affairs. Shrestha is largely taken as one of the sharp brains of the India’s RAW machinery working to control Nepal politics. Shrestha has several times denied being close to Indian intelligence agency though. Analysts believe the government’s attempt to pacify the matter by issuing another statement but it is in fact no different than Prachanda’s rough and tough views on the Venezuelan episode. It is only that the statement has been written in a polished manner in order to appease the US. The US perhaps is not that fool. Back in Nepal, only recently the US Ambassador Randy Berry conspicuously skipped the diplomatic meet convened by Prime Minister Oli and Foreign Minister PK Gyawali to explain some of the Nepalese stands on certain national and international issues. Ambassador Berry’s absence perhaps hints that the US is not at all happy with the way Nepal’s government is handling the Venezuelan issue. Underneath, it is also being talked that the US- the lone super power, is determined not to allow yet another regime of the sort of North Korea in Asia. Prachanda did his job honestly as instructed by his New Delhi masters and in doing so also sowed seeds of grand fracture in the party. In response to Prachanda’s tough statement, the US and its Western allies can easily drag him to The Hague Tribunal, if they so desire, for his war crimes that has gone so far unpunished. Asking Prachanda to issue the anti-US statement, observers in Nepal opine that first, India wants to tell the US to limit its unrestrained activities in its backyard, and second India wants to discredit Prime Minister Oli of Nepal in the eyes of the US administration and finally, it also prefers to destabilize Nepali politics by splitting the ruling communist party with the objective of derailing the majority government. The idea is to bring its presumed puppet, Prachanda back to power. In the meanwhile, the U.S., along with dozens of other states, have very freshly awarded recognition to Juan Guaidó, the president of Venezuela’s National Assembly, as the legitimate president of Venezuela. Discussion of international recognition of Guaidó’s presidency has focused largely on the political implications of the move as a rejection of Nicolás Maduro’s corrupt communist dictatorship. As regards the notion that the communists are corrupt is true in Nepal as these communist leaders have amassed astronomical amount of wealth by draining the national exchequer. The loot continues. Leaving the top communist leaders apart, their hangers on too have flattened their riches but yet claim that they were messiah of the proletariat even as of now. The foot path dwelling Communists of the not so distant past possess immense wealth in India. They have landed properties in Delhi, it is rumored. To come to a conclusion, Nepal Government in an oblique manner tried to align with the US stance on Venezuela but appears United States is not at all convinced with the clarification. This came to the open when the US envoy skipped a diplomatic meet organized by Nepal Government and also that Nepal’s ambassador was summoned by the US administration in Washington, recently. Nepal indeed matters for the United States of America. Now the question is how long the Venezuelan Maduro type government in Nepal will be allowed to continue? Isn’t it the time for the Nepal Army to jump into the political scene and make the disgraced Nepali population happier by doing the job that is in the national interests. The Nepal Army has political reasons to control the national politics from going into the firm grips of communists. Whether it is KP Oli, Baburam or Pushpa Kamal, the India indoctrinated communists must go once and for all. If the Army dares to take the needed action, the aggrieved Nepali population like the starving Venezuelan population will in all likelihood come to support the Army.